Consciously or subconsciously, our lives have been made better some way or the other, all credits to the elevation and growth of technology around the globe. Shopping can be done from where we are; things can be traded with just a click of a button, from establishing goals to constructing out a plan in bringing it out to realism and more. Most things now can be achieved and accomplished with the aid of tech-based products and apps. The journey of technology to impact lives has entered all the crossroads. Software Testing is no exemption. Over the last couple of years, the setting-in of technology is nothing short of what we call a ‘tech-revolution’ in terms of how products/software are tried and tested in the market. This not only led to the expedition of generating products and services but also boosted the global economy and testing community grow manifold, creating new opportunities to testers and others likewise. From the anticipated entry of Artificial Intelligence to Digital Excellence and Transformation, 2019 is nothing short of a year with excitement and amusements. 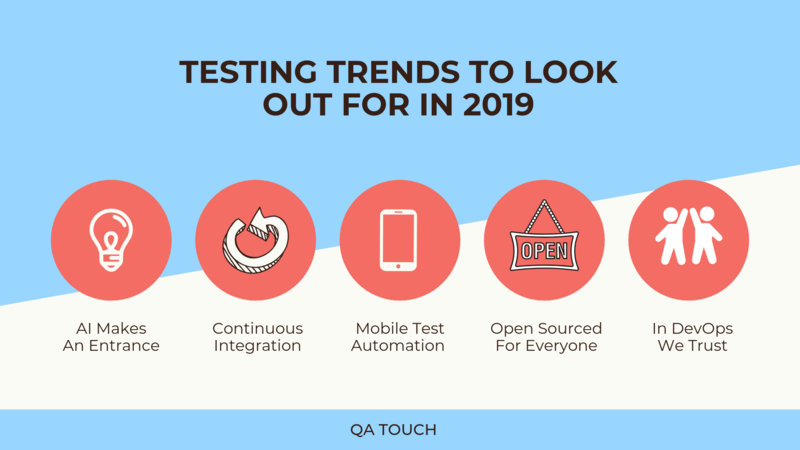 Let us take a look at the most happening testing trends to look out for in 2019 and beyond. Though the nucleus of AI Implementation is aimed and boosted to make software testing process more comfortable and better, it will also be of great help to automate the process which thereby will reduce the quantity of minimal and minute tasks by a substantial degree. 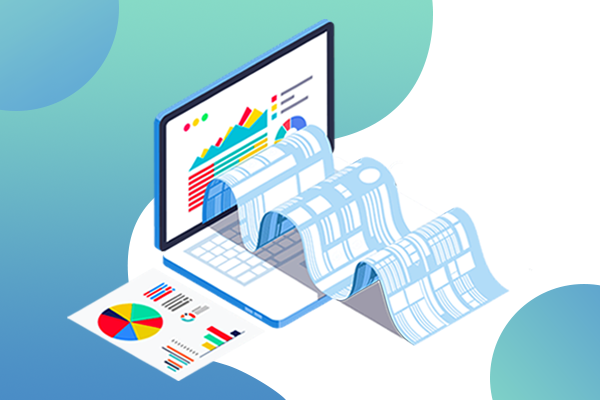 Running tests, creating reports, reasoning, problem-solving, understanding the issue, offering a solution and many more can be efficiently done by an AI infused and engineered testing tool, making repetitive and follow up tasks less for the humans. Even a tiny disturbance and distraction from the normal process functioning can be identified by AI, which sometimes may go unnoticed by testers and developers. Time-saving is another facet in terms of how AI will make the testing process better. From what took weeks earlier, can now be automated and done within days or minutes, with the intervention of AI. Continuous Integration is something which requires intervention on a daily basis to ensure software which is being built is tested and pushing out bugs as and when they are spotted. Defects identified very early in the process makes it easy to resolve, and testers carve changes swiftly. However, Continuous Integration comes with its own baggage of load by the need to have developers take a look at it multiple times in a day to fix issues. The best way to tackle this and increase team productivity is to digitize continuous integration so the crew can focus more on other avenues if this issue can be taken care of by itself. Automation also has the potential to better the quality of software under development. Implanting a recurring and automated tool which can do code changes and mundane tasks by itself, is going to be an intriguing trend to look out for this season on how it is presumed to transform continuous integration. This generation can also be dubbed as the Mobile-Gen in lieu with the amount of time people are spending, with their eyes glued to the cell phone screens. One look at the Google Play Store or the App Store and you can find so many apps thronging into the market every day. It is undoubtedly survival of the fittest when it comes to apps. To be the fittest, one requires an immense amount of workout which is precisely what mobile testing does – to determine how able and apt the app is performing. Mobile testing is not an easy task and is a more complex web than the already existing non-mobile testing software. It claims time and human resources. But with automation in our yard to test the app, things can become pretty much under control. The times are shifting. Mobile Automation Testing Tools are gently gaining throttle supporting testers and developers save their time and efforts. Maybe this year, with Mobile Test Automation stepping into the mainstream, apps are going to get much better and fancier. Have you ever felt while using an app that, if a diminutive feature added would have made the user experience much better? Being a developer, have you come across this situation where a feature which client asked gave you sleepless nights to crack and code? There are so many people around the world who do software development and testing. The odds also are more that whatever you are facing tough to get through, somewhere, someone would have already transcended the same barrier. These times, with Open Source Tools in place, they have been a huge plus to many companies by helping them jump ahead a few steps using already available Open Source Tests. This also gives us the liberty to design the way we want. And with many Integrations within grasp, we can design, develop, automate, run test cases, etc. in breakneck speed. The role of Open Source is going to be very influential. Operational efficiency and outstanding performance. DevOps (Development and Operations) is what binds development team with those who are responsible for operations in a company. With such a stable collaboration and communication between developers and operations team in place, productivity and overall performance can be enhanced. Sharing insights and reckoning each other’s responsibilities can be handy with DevOps in place, which in turn shall help to give better output at a quicker pace with minor iterations. With effective communication in place, the developers can experience how business is happening and what the trends tell. At the same time, the operations team will have an idea on what is being readied, so that they can prepare themselves to release the product, market placing and pricing and sales pitch accordingly. The most surprising things about trends are, we never know what changes when. What was trending for weeks can fall over a matter of time, and what no one comprehended about, can become an overnight viral trend. So, let’s wait and see what 2019 has in store for software testing and development. We will be back soon presenting a few more things which we feel would trend the industry in 2019. Follow for this space for your weekly dose of knowledge and learning. Akash, Content Writer at DCKAP is a voracious reader and a budding content writer who loves weaving words to create stories and sentences. Loves reading poetry and non-fiction novellas on tales which are often not told and heard. 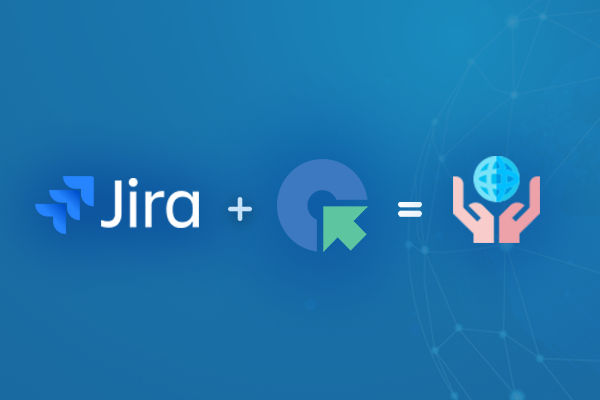 Previous PostHow to integrate Jira Cloud and QA touch with latest release? Next PostHow To Integrate GitHub with QA touch?